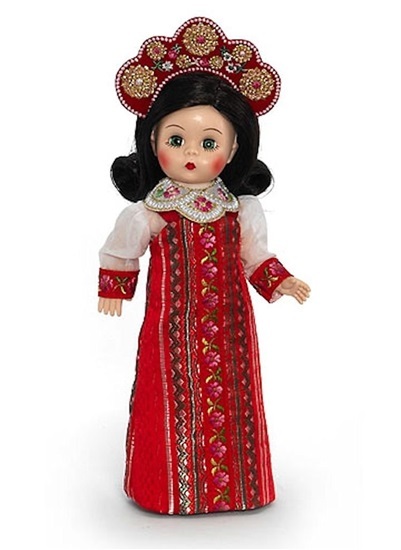 his green eyed beauty is an 8-inch fully articulated Wendy with a traditional Russian costume. We are pleased to share "WIth Love From Russia" from the Madame Alexander International Collection. This is an 8-inch fully-articulated Wendy with green eyes and long, wavy brunette hair, wearing a traditional Russian costume. She is dressed in a red brocade 'sarafan' that is enhanced by pink floral ribbon down the center-front of the gown. Beneath the 'sarafan' she wears a translucent pale pink blouse with long sleeves, which are trimmed at the edge to match the gown. A white organdy collar trimmed with red and pink embroidery finishes the dress. Includes White pantyhose; red velvet Mary Janes; and an elaborate gold and floral kokoshnik (headdress).